Today I went to Seckman High school’s track to do speed work. For this years marathon training I decided to use my Nike plus running app coach. This is a totally free coach and since I’m pretty self motivated it works for me. So today was run 400 meters (one lap) and then walk for two and a half minutes and then repeat ten times. It gave me a projected pace of 10:37 which as usual triggered my anxiety for no reason. My pace for the running portion was 9:35. When I first arrived I realized it’s been a long time since I was there. When I trained for my first half back in 2005 l did almost all my runs there and counted laps. So as I looked at the football field and admired the AstroTurf I thought about all the changes. My very first time at the track I was still smoking. So I would smoke all the way there, do my miles, and smoke all the way home. I listened to a portable CD player and headphones and was there a lot of times when the kids were out for gym. Another four years passed before I did my next half. By this time I had quit smoking and iPods had been invented and I owned one. Nike invented a chip that went in your shoe and correlated with your iPod to keep track of distance. I would soon ditch the track because it was monotonous running in circles. The following year I invested in an iPhone and upgraded to Nike+ running app and ditched the chip. I also no longer had to carry my phone and my iPod. I then started running on the road and convinced myself I am invisible and no one can see my running. It was the only way I survived running without having major anxiety that people were laughing at me. I seriously cannot remember the last time I was at the track. Most likely the summer I was supposed to run a race to benefit Seckman track club and had the start time wrong and missed the race. I thought about the guy that took care of the football field grass and would mark it for football games. I wonder what he is doing now. He would always say hi to me even though I was invisible at the track as well. Mole moral~No matter how hard one tries, it is impossible to slow down both time and the change that comes with it. It was sometime around November 2015 when Emily the Director of Women’s Services asked us to read a book called One Word in preparation for 2016. I always did every single reading assignment in college so of course I read this book. Basically instead of making a bunch of New Years Resolutions that are often forgotten or broken within the first month, you choose one word to focus on for the year. She gave all of women’s services (women’s health, mother/baby, antepartum, labor and birth, perinatal center, birthing center, and education) the task of choosing one word to focus on in 2017. The word we chose was Dedication and each month we had something different to remind us. This involved me and the crafty side for a few of the months and I really enjoyed it. This year women’s services is focusing on Teamwork and I am pretty excited for February’s reminder because it involves the winter Olympics. Last year I chose a word for myself but three weeks in the headache started and I thought of it off and on but it kind of fell by the way side. I decided this word would be my word for this year and I would blog about it to hold myself accountable. So the word that came to mind was SOFT. There are two parts to this and the first is the more excited, annoyed, nervous I get the louder I become. I can find myself almost shouting at times and most of the time it is not necessary. The second half of my language and my cursing. It is such a bad habit that I need to break. It goes hand in hand with the excitement, annoyed, and nervous and being loud. The more worked up I get the more each of them get out of control. It came the last week so now it is time to take it out of the package and get busy not yelling and cursing. Mole Moral~When you already exercise by being obsessed with running you have to get creative with New Years Resolutions. As I begin to type this I want to clarify something first. The best place to run is outside. I would rather be out there any given time. However, when the heat index is over 100 or the wind chill is less than twenty then running outdoors is not a safe option. Saint Louis has been stupid cold for the past two weeks, just in time for me to start full marathon training. The holidays were also factored in so that made me stuck on the treadmill for the past week and a half but today I managed to make it to the Arnold Rec Center. I love the rec center. I would rather do thirteen laps per mile than run on a treadmill not really moving. Everyone is like just watch TV. No matter what I put on, I am staring at how long I have been on the stupid thing just waiting for it to be over. At the indoor track I can people watch. Usually there are boys playing basketball below me, or girls practicing baton or couples playing pickle ball. Also on the track, I recognize people who I see from time to time. Although I don’t talk to any of them, I have names for them and know if they are there, then they are well. There is a couple that walk together all the time and they are fast walkers. They probably pull a thirteen minute mile. I like to follow them when I am not running but walking. Last year when I was training for the fifty mile a guy asked me what I was training for. So I told him about the race. He lives close to me and told me he saw me on the outer road all the time as well. One day in September he was driving and saw me and pulled over and asked how the race was. So I told him all about it. He was there today and stopped me because he was telling his friend about me and wanted to know how long it took me. I said 13:57. They asked me if I was going to do it again this year. I said hell no, one and done. They both started laughing. There was a guy named Ron who use to be there all the time. I haven’t seen him in almost a year. I need to ask a couple of the regulars what happened to him. Today a gal was wearing an Oak Bridge Church shirt and I almost said to her, best church ever! She might have thought I was crazy. However running 10 miles there today was totally normal! Although ten miles on a treadmill is total insanity. I would go to the indoor track any time any day when the weather is uncooperative. Mole Moral~ Find an exercise you enjoy and stick to it. You never know who you might meet or who you might encourage! Yesterday I did a Facebook game where it gave a picture review of the year. I had been thinking the year had been kind of yucky but looking at the pictures and reflecting back, the Moles had a really good year. I decided to highlight the positives. Of course having a blog makes remembering things so much easier. January started with Brian finally getting a TV that hangs on the wall. He also lost a dollar bet in that the TV would be gone from his friend’s apartment trash site before the trash came. He didn’t even get it unloaded before someone took it off of his hands. February was the worst headache I had ever had in my life. I call that a ten out of ten pain because I prayed for almost eight hours straight for God to take me to heaven to be with my grandparents. I would have shot up heroin if it would have taken the pain away. No matter what drugs were given to me, nothing touched it. Only when my primary did a neck manipulation did it start to go away. This would be important later on. March was when Emily moved back home from Kansas City. It was her last Physical Therapy clinical’s in the burn unit at Mercy. She loved it and I loved the fact that I worked there when I was pregnant with her and now she was there. I also officially announced that I had to postpone the fifty mile run that i had planned for April. I actually cried the first time I said it out loud but my boss Emily said “oh you will run it in the year you turn fifty and that counts”. She is so smart. In April I would finally finish a crochet granny square blanket. All my life I wanted to learn how to make granny squares. My Grandma Carty had a pillow made out of them and an afghan. Finally thanks to you tube I was able to understand the pattern. Little did I know that at the end of the year, I would give this blanket to my best friend for baby number eleven. May brought my fiftieth birthday and my oldest graduation from Rockhurst. 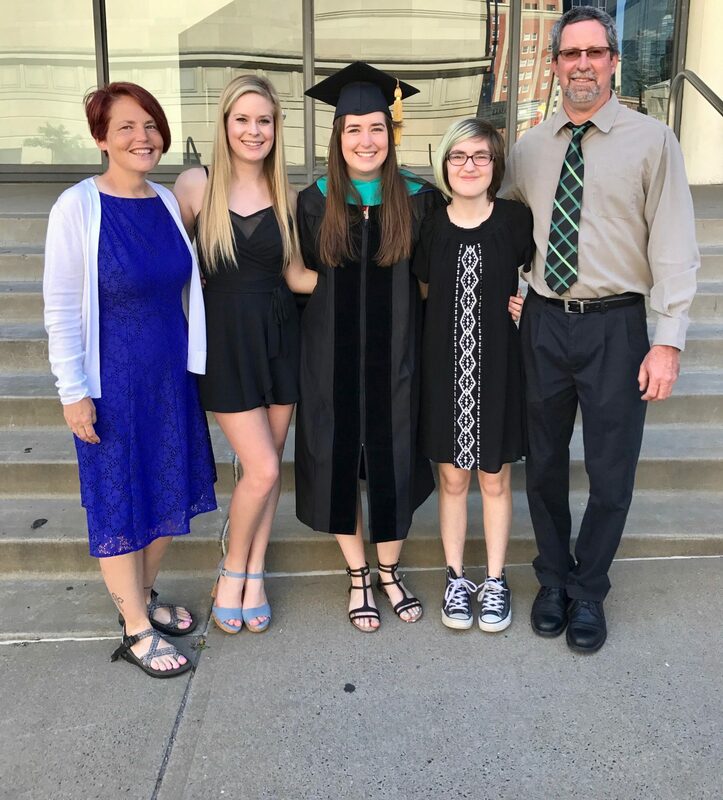 Emily is the first in the family to have a doctorate degree. It was such a proud moment when she walked across the stage and received her diploma and hood. June brought our last family vacation as a family of five. We spent a week in Tennessee and had an absolute blast. I don’t think there was anything funnier than me on the high ropes trying hard not to fall off or lose my balance. I never laughed so hard in my entire life. Of course Emily took one of the funniest pictures ever in which every one of us was wearing red but her. She called it Mole roll call so no one gets lost. We also went on a wild goose chase for moonshine. The first place we went not only didn’t have it but was shady and in a shady neighborhood. We did eventually find it and then discovered where it can be purchased in St. Louis. July was the month Emily moved to California. She took her first job as a travel Physical Therapist. Luckily she was only three hours from our good friends Gary and Heidi. Even though she didn’t think I needed to drive out with her, she was glad that I did. We had a great road trip and even saw Mike the Headless Chicken. August was the fifty mile marathon and Brian and I had a great vacation just the two of us. We spent a week in South Dakota and had a lot of fun. We even trespassed and saw the Flintstones RV park that had closed. September was my twenty-one day food detox and I felt so good afterwards. I must admit I fell off the wagon in just two short months. It’s a lot of work to make every meal and I started making excuses right and left. Maybe this coming year I will get back on as I never felt so good. October was the month I got out of my comfort zone. I signed up for a Pokemon walk and met up with other Pokemon people. I didn’t know a single person and I survived. It was also the month of one of my favorite 5K’s. It was the Run for Ovarian Cancer. November brought my moms fall and surgery. It was a rough month for her. Allyson started her job at the Local House and has made quite a bit of money. Her goal was to pay for her server and have money this summer when she goes out to stay with Emily. She has already met both goals. My headache returned and since Western medicine did nothing earlier in the year I went to a Chiropractor and was greatly improved and able to work within twenty-four hours. December was the month God almost slapped me upside the head with the Christmas Angel. I really did question if I had picked the right person, even though I knew he had told me it was. I had the most awesome photo and post placed on my wall by the person I had angeled. I have never felt so blessed in my life. Mole Moral ~ It is so easy to focus on the negative and forget all the positive. Just like one negative comment takes twenty positive ones to make up for.